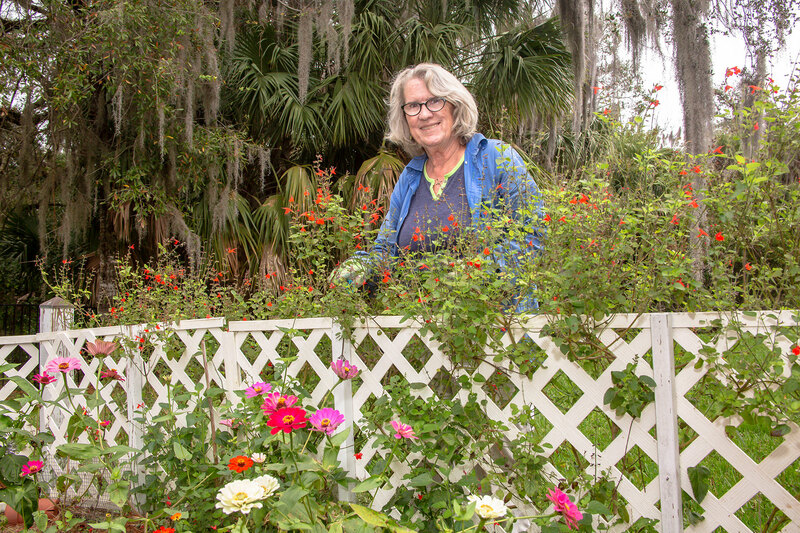 After 10 years as president of the Lakelas Mint Chapter of the Florida Native Plant Society, Annmarie Loveridge is hanging up her garden gloves and pruning shears. Known locally as the expert on native plants and their care, Loveridge is a bit of a plant whisperer who can look at a withering bush and know just what it needs to make a comeback. These days she uses only natural fertilizers — no Roundup, chemicals or plastic. Loveridge has some tips for gardeners to be eco-friendly and save a lot of money at the same time. For instance, instead of plastic tarp, use eight to 10 pieces of newspaper and get it very wet before putting down the mulch. The worms eat the newspaper and provide nutrients for plants. Use only locally made fertilizers, and don’t apply them during the rainy season or too close to nearby canals, lakes, streams or rivers. There are local manufacturers in Martin, St. Lucie and Indian River counties if you must use manufactured fertilizers. Loveridge recommends instead getting free coffee grounds from Starbucks or Dunkin’ Donuts, who will give them to you in a package to feed your plants. The problem with mulch in Florida is it most often comes from cypress trees, which have no micronutrients. Loveridge says she doesn’t understand why Florida is the only Southern state without restrictions on cutting down cypress trees. She recommends signing up for Florida Power and Light’s Asplundh debris removal list so they will deliver a big pile of mulch — with nutrients — for free to your house. Loveridge says bird excrement with berries is what causes pepper trees to pop up just about anywhere, not the seeds by themselves. Tree services are often happy to give you even better mulch, she says. Another way to improve your garden is to take your yard waste and sprinkle it near plants that need nitrogen. And the more mulch the better. “We as homeowners can be smarter in our choices of mulch and fertilizers,” says Loveridge. “You don’t have to be the tidiest gardener. Natural gardening is OK, and you can do it. It just takes commitment.” Vinegar and salt make a natural combination to kill weeds growing up between the cracks, she says. As a security guard for All Star Women’s Security, Loveridge worked boat shows in Miami until a friend told her she could make more money as a plant technician. A new career was born, and she began taking care of plants in swanky offices and banks on Brickell Avenue and homes with addresses such as Star Island. An expert at all phases of horticulture, Annmarie Loveridge advises gardeners to increase the canopy by cutting back each little branch and decrease canopy by cutting behind the cluster. “It was the late 1970s, and all the time we would see guys (drug smugglers) with big briefcases coming into banks and heading into the room with the safe deposit boxes,” Loveridge says. After her two sons were born, the family moved to Fort Pierce because they didn’t want to raise their children in Broward County. For the past 26 years, the Loveridges have lived on the grounds of Fort Pierce Inlet State Park, where husband, Tom, is a park ranger. “We raised two surfer boys who could walk to the beach,” she says. “We are bug food here. We haven’t seen otters lately, but we see bobcats and gopher tortoises all the time.” After the hurricanes came through the park in 2004, native plants and trees were damaged. Loveridge plans to undertake a second effort to label all the plants along the park’s two trails. Long a fixture in the St. Lucie County gardening community, Loveridge occasionally gives talks as a moderator to standing-room-only crowds. 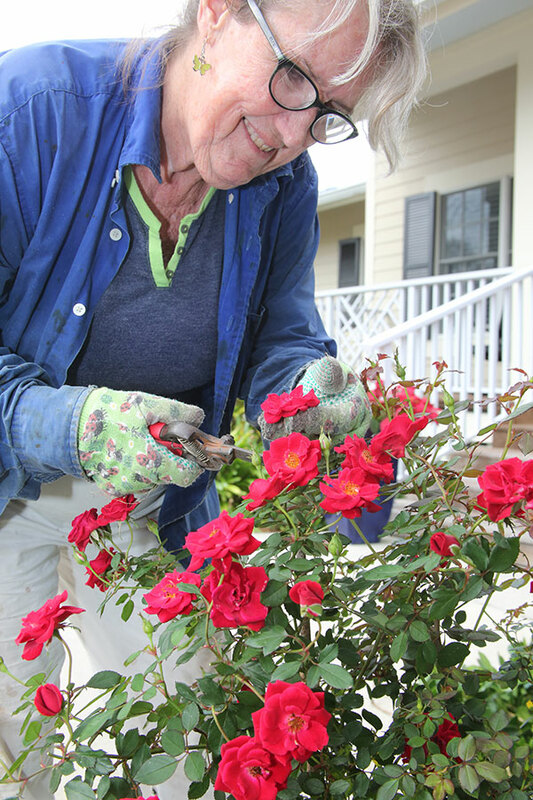 She is also the driving force behind the annual native plant sale to benefit Heathcote Botanical Gardens in Fort Pierce, donating more than 300 hours of service since 2000.